this is a sight that i will truly miss as the days grow cold. i am absolutely appalled, but i can't say that i am surprised. so apparently there has been a plea floating around natural parenting message boards and forums asking those who have had positive out of hospital births to send their stories to the dr. phil show. homebirth midwives are asked to share their experiences with the show as well. or how about hospital horror stories? do you or someone you know have regrets about an obstetrician attended hospital birth? why not ask viewers to send in those stories? yesterday i blogged about our first day of school. i wrote about how bittersweet it was to send esme' off to kindergarten and how nice everyone looked in their new clothes. what i didn't reveal was just how absolutely over the top crazy our day was. i dropped the big kids off at 7:30 am. riley had football practice immediately after school but niko needed to be picked up at noon. esme' class started at 11:30. we dropped her off, said our tearful goodbyes and left. we then stopped for coffee. then we came home. i knitted a little, nursed and cuddled harper and it wasn't until i went to get him a snack from the kitchen that i suddenly realized that we had never picked niko up! it was now nearly 1pm. a full hour after her school day had ended. i rushed into the garage to inform tony that we were terrible parents and that we needed to leave... NOW! the whole car ride over i was anxious. i felt bad for forgetting and i was also worried that she would not be right out in front of the school anymore. i worried that we would have to look for her and as a result would be late picking esme' up at 1:15. finally we were approaching the school and as tony turned into the parking lot i notice riley walking down the street with his friends. what the heck is he doing??!! we pull up to the front of the school and grab poor niko then quickly turn the car around to confront riley. riley: (very surprised to see me) we walked to the store because i was starving. me: what time does practice start? okay, you get the point. apparently he was starving and had to walk to store to buy a 1/2 pound box of mike and ikes before he could possibly even think about football practice. but there is no time to deal with this now, i have a kindergartner to pick up. i tell him to get his behind to practice and off we race to esme's school. we got there in time to see her come out of the classroom with all the other brand new students in a perfect single file line. she was grinning from ear to ear and i could immediately tell that she was changed forever by the experience of school. she had had a perfectly wonderful day. today is the first day of school. riley and niko were up early and dressed in their school uniforms. i loaded them into the van and dropped them off at the newly built junior high. they looked a little like fast food restaurant employees! then, this afternoon, right after lunch, we took miss esme' to her very first day of kindergarten. i was prepared for some tears, maybe she would be shy and try to hide behind myself or daddy. perhaps she wouldn't want harper to leave. but no, none of that, she was ready. however there were a couple tears shed by her daddy and i. proud tears that sat lumped up in the back of our throats until we were out the door and in the car. those bittersweet "where has the time gone" tears. Papa is in washington visiting my brother and his wife. we miss you Papa and can't wait for you to get home! tonight is our first official "school night" of the year. brand new outfits are laid out, full back packs are lined up at the front door, alarm clocks are set and bedtime came an hour early. everyone is looking forward to new schools, new friends and brand new adventures. 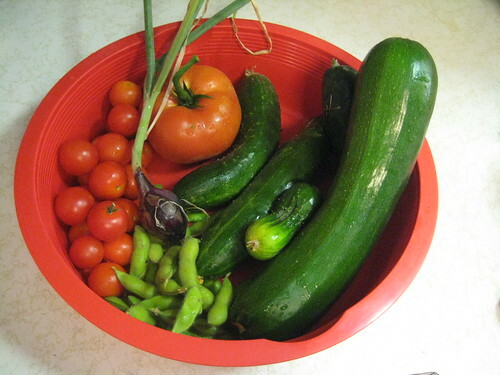 today our garden gave us one zucchini, a few cucumbers, a handful of cherry tomatoes, one large tomato (the garden squirrel got the other ripe tomato), some edamame pods and a tiny red onion that esme' insisted was ready to be pulled from the earth. and we are thankful for every last bite! this is a wonderful alternative to commercial anti-perspirants/ deodorants~ it is lovingly made with organic ingredients and scented with essential oils. i think it is the best stuff ever, but you will just have to see for yourself! i also stocked some pretty hand dyed wool and these fun fabric covered button rings! and lastly, leave a little comment on this post and i will randomly choose a name on friday, august 22nd and send that person a tin of smell better butter in any scent they choose! Well, if I don't win, I think I'll be buying some smell better butter anyway! I have wanted to make some and try it, but just don't have the time. So, yipee for my friend Erika! i am afraid our easy livin' summertime days have come to an end. a screeching halt more like it. i spent 2 hours at the new jr. high (yes, i have jr high aged children!!) registering riley on tuesday and another 4 hours there registering niko this morning. monday evening was parent orientation at esme's school and this coming monday we get to go and see her classroom and she will meet her kindergarten teacher for the first time. tomorrow is riley's first football practice and i will need to have him dropped off at 8 am and picked up at 1:30 pm. school starts on august 25th for all of them so i am trying to get all of us back on schedule. i have also been working very hard to get things ready for my shop. i have some very fun things in the works and am hoping to stock tomorrow so be sure to check in! yes, i am already mourning those lazy, sleep in way too late, living for the moment summer days. i didn't post any garden updates or photos this year. everything grew big and fast and we have been enjoying fresh veggies for a couple months. we have had tons of cucumbers and even more zucchini. as soon as our tomatoes started turning red a little squirell started stealing them. just when i thought he was going to eat every single one he stopped. we have several pumpkins including one that is already big and bright orange. here is the last bunch of rainbow carrots. we usually do not plant carrots because i find them hard to grow and they are actually pretty cheap to buy. but we couldn't resist these colorful carrots and they really were alot of fun. and we had the prettiest summer dinner salads ever! this is harper's baby doll. we bought it at a thrift store when he was only a couple months old. he liked it for awhile and then it sat untouched and forgotten at the bottom of the toy box. last week he rediscovered his love for the baby doll. he was downright excited when we got the dolly sling out. now he can walk the baby around the house with his hands free to play! brilliant! he brings me the baby and the sling at least once a day now. when his baby is snug in the pink-rosey carrier he just walks and walks all over the house, while his mama's heart swells with love. *please ignore the very ugly wall in the background of that last photo~ our home is still in the process of remodel, big sigh. thank you for understanding! i finally finished that bag. you remember, the one i blogged about here, and then again here. i actually finished it before we went on vacation. the night before we left when i should have been busy doing laundry and packing suitcases i was feverishly sewing so i could have a pretty new bag to carry while taking in the sights on our journey. i was inspired to sew a diaper bag with these particular amy butler prints after seeing this beautiful bag sewn by kris from monkey foot designs. i added little loops to the bottom back corners so i can tie the straps and wear it backpack style too. love that feature! i am glad i finished it when i did because the way my house looks right now i feel like i may never be able to sew again. we started our home make over and i am fearful that our little dwelling will never be the same! we currently have partially torn out carpet, furniture pushed up against walls in places where it does not normally belong, walls that need patching, boxes of stuff all over the living room.... eek, the list goes on and on! i am trying to keep my cool and visualize how nice it will be when we are done. nice, deep breaths. everything will be just fine... serenity now! and on the salmon river! we are home again. we actually got home wednesday afternoon but it has taken me a few days to decompress and get back into the swing of things. our trip was wonderful~ very busy, often stressful, but full of wonderful fun! i have so many photos to share but i'll start with these favorites. here is the stuff esme' tried to take along. we had to wheel and deal with her to leave some of it at home. all the kids spending the day at teton villiage, jackson hole. esme' poses like a super model! yellowstone, and again with the pose! daddy with harper, seeing the geysers for the time in yellowstone. inspired mama and all her kiddos on the lochsa river! i tell you, this is a rarity to get all the kids together for a single picture, so i will treasure this one for sure!